Rajasthan: the land of the Royals is a very prominent tourist attraction in India. The state itself drags the maximum number of tourist in India. Each and every corner of Rajasthan is an attraction for the travelers. From the monuments to people to culture and to food; everything here is awe-inspiring. Travelers from all around the world come here to get the best travel memories. The state has a larger geographical area and is counted one amongst the biggest states in India after Madhya Pradesh. The geographical area expansion of Rajasthan provides a great favor for the tourism opportunity too. There are many places to see here but for a visitor it is not possible to see each and every minor and major thing here. Sometimes it happen that people they visit not so important places and in the scarcity of time they miss the important one. Every place here is important, but the capital of Rajasthan has its own significance. If you are visiting Jaipur hen here are the places that you should never miss on your trip. The capital of Rajasthan is the first thing you would hear about the state. Though there are many other beautiful destinations in the state, but no other place has comparison with Jaipur. The capital is also referred as the pink city reason being the pink color of architecture all over the city. The first attraction of the city is definitely the pink color of whole city and other than this there are several other things that you should not miss on a trip to the place. City Palace: A complex of courtyards, gardens and buildings, the impressive City Palace is right in the centre of the Old City. The outer wall was built by Jai Singh II, but within it the palace has been enlarged and adapted over the centuries. There are palace buildings from different eras, some dating from the early 20th century. It is a striking blend of Rajasthani and Mughal architecture. So, a perfect treat for your eyes. Hawa Mahal: Jaipur’s most distinctive landmark, the Hawa Mahal is an extraordinary pink-painted delicately honeycombed hive that raises a dizzying five storeys. It was constructed in 1799 by Maharaja Sawai Pratap Singh to enable ladies of the royal household to watch the life and processions of the city. The top offers stunning views over Jantar Mantar and the City Palace in one direction and over Sireh Deori Bazaar in the other. Jantar Mantar: Adjacent to the City Palace is Jantar Mantar, an observatory begun by Jai Singh II in 1728 that resembles a collection of bizarre giant sculptures. Built for measuring the heavens, the name is derived from the Sanskrit yanta mantr, meaning ‘instrument of calculation’, and in 2010 it was added to India’s list of Unesco World Heritage Sites. Paying for a local guide is highly recommended if you wish to learn how each fascinating instrument works. Iswari Minar Swarga Sal: Piercing the skyline near the City Palace is this unusual minaret, erected in the 1740s by Jai Singh II’s son and successor Iswari. The entrance is around the back of the row of shops fronting Chandpol Bazaar – take the alley 50m west of the minaret along the bazaar or go via the Atishpol entrance to the City Palace compound, 150m east of the minaret. You can spiral to the top of the minaret for excellent views. Central Museum: This museum is housed in the spectacularly florid Albert Hall, south of the Old City. The building was designed by Sir Swinton Jacob, and combines elements of English and North Indian architecture, as well as huge friezes celebrating the world’s great cultures. It was known as the pride of the new Jaipur when it opened in 1887. The grand old building hosts an eclectic array of tribal dress, dioramas, sculptures, miniature paintings, carpets, musical instruments and even an Egyptian mummy. Nahargarh: Built in 1734 and extended in 1868, this sturdy fort overlooks the city from a sheer ridge to the north. The story goes that the fort was named after Nahar Singh, a dead prince whose restless spirit was disrupting construction. Whatever was built in the day crumbled in the night. The prince agreed to leave on condition that the fort was named for him. The views are glorious and there’s a restaurant that’s perfect for a beer. Jal Mahal: Near the cenotaphs of the maharanis of Jaipur, and beautifully situated in the watery expanse of Man Sagar, is this dreamlike palace. It’s origins are uncertain, but it was believed to have been extensively restored if not built by Jai Singh II (1734). It’s accessed via a causeway at the rear, and is undergoing restoration under the auspices of the Jal Tarang project. Maharaja Sawai Mansingh II Museum: Mubarak Mahal (Welcome Palace) in the City Palace forms part of the Maharaja Sawai Mansingh II Museum, containing a collection of royal costumes and superb shawls, including Kashmiri pashmina. One remarkable exhibit is Sawai Madho Singh I’s capacious clothing; it’s said he was a cuddly 2m tall, 1.2m wide and 250kg. These are the places that you should not miss out when you are travelling Jaipur. 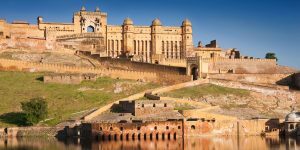 For a guided tour of the city or for the same day Jaipur trip you can contact Swagat Tours and Travels, a trusted company for best Rajasthan tour packages. Copyright by Swagat Tours © 2019.